■ SCORM 1.2 incl. version 2004 (v1-v4) – allowing you the integration and use of content from other authoring tools. ■ SCORM H5P widget by Eurekos – allows you to include SCORM elements from other authoring tools directly on pages, as interactive page elements. ■ Eurekos import/export of courses covering HTML5 formats and streaming video sharing across Eurekos platforms. ■ Certificates from tests/assessments – high quality PDF certificates designed by your organisation and based on the H5P interactive learning tools. ■ New assignments module – redesigned for better accessibility and provides a great user experience. More than 200 prioritised improvements have been included. Obviously, even through we offer one of the greatest browser based authoring tools available, organisations have “shelf content” used through the years and in many cases don’t want to put in efforts to modernise them. With the SCORM import function, we are supporting any SCORM compliant work from any of the leading authoring tools you might have learning packages from. As you would expect, this has been planned for a long time and we offer a convenient and easy way to import SCORM content. Taking this to the next level, we also developed an H5P SCORM widget, which we have shared with the H5P community. In Eurekos it makes it very easy to include custom SCORM elements on pages directly. No technical skills needed. Point and click. Did you ever want to save a “copy” of your course? Or move it to another Eurekos platform without having to worry about files, documents, images and streaming video? Now, you can do just that. The EUR format saves your course content, interactive H5P elements and stores it in a EUR package format. This format can then be imported again and all materials are organised and assigned to a new owner of your choice. Tidy and clean. Videos you have uploaded to Eurekos are retained as streaming files in the cloud. When you import your course again, Eurekos takes care of everything. Behind the scenes – even across different Eurekos platforms – videos are cloned and moved in the cloud, not bothering you with the potentially huge amount of data. We have developed PDF certificate support for H5P interactive tools. And we have made it easier than you have ever seen. ■ Create your PDF certificate template in any tool you prefer – no creative restrictions! ■ Add it to the element – and task completed! Certificates are included for download in several places to provide optimum user experience. We even check if you are entering a course page containing a page element, which you have passed already. Of course you can change the texts to suit your purpose. This release covers a completely updated user experience on Assignments and student submissions. We have made it easier and more convenient to see progress of peer reviews, status on submissions and much more. 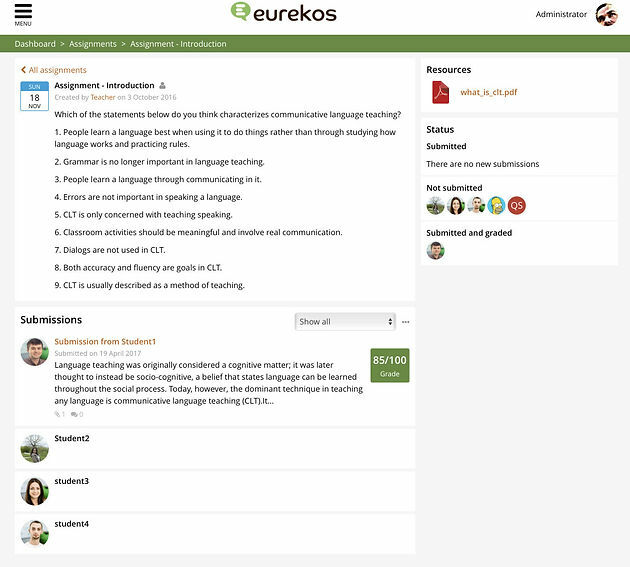 Views are separated, attachments are clearly displayed and accessed and communication features are updated to the same great experience, you have been accustomed to, in Eurekos. Also, notifications to tip on status or changes has been improved and included in this update. ■ New user import with improved automation of users, allowing a more fluid process and user generated personal password creation. ■ Much improved video player actions on mobile with performance updates. ■ Videos can be downloaded by video owners, from the video archive. ■ Greatly improved user experience on asset management, when building courses. Latest opened folder position and search criteria is saved, making it easier and faster to navigate objects. ■ Notify functions on updates and changes (instant email) are added in create actions multiple create function in Eurekos. ■ Images can be rotated in Teams directly by clicking the rotate function, tackling issues with mobile photos in the “wrong” mode. ■ Clicking images in Communities and Teams opens in enlarged format. ■ Mobile and tablet responsiveness improved even further. By David Perring, David Patterson, Hans van Bergen, Kenny Munck, Nick Etlar Eriksen, Søren Rågård, and Omeed Aminian. 7 Industry experts provide sensible solutions about how you can identify and close nagging skills gaps in your organization. I consent that personal details will be accessible to Eurekos who may contact me. You can unsubscribe at any time by visiting our marketing preference centre. Finally, an LMS that puts content first. Eurekos helps clients and partners create impactful learning by speeding the creation and delivery of learning content.